You know what I mean. You’ve had that moment when something broke through your thick skull. Sometimes it arrives there because someone’s hammered it through, repeating the same thing over and over. But when it’s been hammered through, it just sits there, lodged. When a thought catches you by surprise, it flies into your head, and keeps flying around there. While it’s flying around, it changes everything. Not only have you learned something, but that learning has changed you. In the “Knowledge Creation” thread of The Atlas of New Librarianship, Lankes discusses Conversation Theory, and presents knowledge as created through conversation (p. 31). He briefly explains some foundational ideas of language in Conversation Theory, that learning happens as we pass through two different levels of language: L0, which is language simply used to negotiate a conversation, and L1, which is language used to actually further the conversation. Basically, if you can’t agree on your terms, you can’t move the conversation forward. There can be no real surprise, no real learning. How many times have you been stuck in a conversation where you thought you were getting somewhere, but then it turned out that you weren’t even talking about the same thing? For me, it’s a large number. If we can’t have a meaningful conversation about something because we spend all our time trying to come to an agreement over the terms we use, then the terms become obstacles, not the means to an end as they should be. I blame it on the tendency in academia, and really in all professionalization, for extreme specialization. I don’t fit in to this – I have always done very multi-disciplinary work; in fact, I don’t think I’ve ever worked in a form that was strongly tied to one disciplinary perspective (I’ve worked in theatre for over 20 years. For every show you have to become an expert in something new, and take on a new perspective. I’ve never settled into one mindset for very long). But over the last ten years, my work with material culture, history, and digital collections has placed me at the table with some very special people – specialists, specialized. Speaking, as it turns out, a very special language. I have come to recognize the need to translate, the need to clarify that what I think they’re saying is what they really mean. I think this kind of “translation” ability is exactly the skill that a librarian needs to bring to the table. As current academic systems of promotion push people to specialize further and further, librarians can be the ones to maintain a strong element of multi-disciplinarity and collaboration, so they can help everyone else to be able to participate in the conversation. In some cases this will involve acting as a translator, and in other cases it may simply involve other means of helping another conversant to find her voice. As I begin in earnest to work on building digital libraries, issues of language – as terminology – are extremely important. An important function of librarianship has been cataloging – describing resources so that others can find them. The inverse of this is scary – when resources are described in such a way that people can’t find them. If I’m looking for what I think of as a blue dress, but it has been catalogued as a teal dress, I may never find it. One word has a great deal of power. Similarly, the hierarchies of some cataloging systems only make sense from one disciplinary perspective – good luck trying to find it when you’re coming at it from a different disciplinary perspective. The alternative idea of “meshes and ontologies” on page 50 is very appealing, but hard to visualize as we are still so tied to hierarchical models. Lankes suggests that “Librarians must build systems that understand that language is not labels but rather individuality and understanding” (p. 39). Yes! But how? How do we conquer variations in use of language, so that we can get to that “A-ha!” moment? I have approximately three years of library school to figure that out and start to build systems that get around these challenges. Lankes, R. D. (2011). The atlas of new librarianship. Cambridge, Mass. : MIT Press . How many professionals really stop to consider their mission? And yet, our work flounders when we lack this sense of mission. How much would it guide our lives to stop each and every day and evaluate how what we’ve done that day lines up with our mission? The answers could guide us in one of two ways – to change our practice to line up better with our mission, or to change our mission statement to line up better with changing values over time. Of course, Lankes’ mission statement seems pretty timeless, an attempt to articulate ideas that are focused on philosophy rather than on tasks/functions, which will change over time. your mission, if you choose to accept it . . . I imagine it is a personal discovery of this mission, a calling, that has led many of us to go back to school to become librarians. That is certainly the case for me, and though I had not articulated it this way, reading Lankes’ mission statement rings true and validates for me that I’m in the right place, doing the right thing. In this thread, Lankes quickly discusses post-modernism and reader-response, constructivism, and learning theory as influential in the worldview presented in his mission statement. Indeed, these are all frameworks that have shaped my personal worldview over many years, so again, I feel like I belong here. to improve people’s understanding of identity by helping them to examine choices in clothing (or lack of choice) as an expression of other factors influencing their lives. While this is very specific and narrow, it’s not entirely unrelated to Lankes’ suggestion of mission. to create high quality digital collections representing the physicality and context of artifacts, so that educators can take advantage of the rich understanding of cultural history that comes from teaching with material culture. Can I reword that to make it more in line with the Atlas? to improve society’s understanding of the implications of personal choices and identity, through the creation of high quality digital collections representing the physicality and context of artifacts, which will facilitate knowledge of culture and cultural history for a community of teachers and learners. Whew. A little clunky, but you get the idea. This mission is indeed a work in progress. Certainly, Lankes mission statement is a little clunky as well – it’s not easy to summarize such grand concepts in so few words, as much as we try to do so daily via Twitter. If I want to digitize a shoe, or a spoon, or a chair, or if I want to preserve the original physical item, it’s not for the fetishization of the object itself, but because that object has a story to tell us about each person who made it or used it or saved it, a story that no document can equal – a conversation waiting to happen. Librarian boot camp (at the Syracuse University iSchool, where I’m pursuing my MLIS) began with a meeting of the information league – a gathering of a wide range of information superheroes, meeting for the first time to begin a mission to help the world access information for good, not evil. Well, kind of. When we arrived to begin our first class at the iSchool, IST601 – Information and Information Environments, we were greeted as superheroes by iSchool professor, and gamification expert, Scott Nicholson. He instructed us to design a sticker badge that would acknowledge our superhero identities. The best I could think of in 15 minutes was to call myself the Advocate. This name has three meanings for me: first of all, in all my years as a designer for theatre and dance, I have considered myself an advocate for the audience, reminding the rest of the production team that the audience will be sitting there with none of the knowledge that has come from weeks of rehearsals. I try to remind them that they need to start at zero, and provide any information that the audience needs to understand the characters and the plot. Secondly, I am very good at playing Devil’s Advocate, pointing out the opposite side to any issue, whether I agree with it or not, just to make sure that all sides have been taken into consideration. Thirdly, I have learned the importance of teaching others to advocate for themselves – something that does not come easily to many people. Proudly wearing our badges (well, maybe not – mostly it felt pretty silly at first, which was precisely why it worked so well as an icebreaker, because we all felt silly together) we “flew” into the open stairwells of the Hall of Languages, and were instructed to keep “flying” around until Scott stopped us and gave us a mission to problem solve with a group of 5-7 other superheroes around us. The real challenge? We had to figure out how our particular superhero powers would complement each other to solve the hypothetical task at hand. Of course this was a great example of how we need to combine forces in collaborative teams for the work that’s ahead of us – and however silly we felt, it was a refreshing way to start the adventure that is Information School. However, as soon as we had finished our superhero icebreaker and returned to the lecture hall and had a moment to reflect, I immediately wanted to revise my superhero identity. Professor Dave Lankes had already started me thinking about my mission after I read his book, The Atlas of New Librarianship, for IST511, and then his introductory lecture for IST601 made me think about it even more, as I sat there contemplating my superpowers. Advocacy is important to me, but that’s only one part of my larger mission. How do I define that mission? How do I apply my particular superhero powers to this mission? What is it that I bring to the table that no one else brings, at least not in quite the same way? I feel like I need to figure this all out right now, but I keep trying to comfort myself that the space and time of library school will help me to articulate this all better. So, I’m still working on the most catchy superhero title to represent the larger mission – I’ll keep you posted. My next post will delve deeper into my mission statement . . . Consider this your warning! I’m getting ready to publish several posts reflecting on my first official week as a new librarian. I was just up at Syracuse University for librarian bootcamp – a week in residence to kick off my pursuit of the MLIS degree, via the Distance Learning program. It was an intense week, and it gave me a lot to think about. Several of the posts are for a class assignment, for IST511 – Introduction to Library and Information Professionals. For that class, I’ll be reflecting on the threads in The Atlas of New Librarianship, by Dave Lankes. I’ll be publishing a slew of posts today, but you probably won’t want to read them all today (if at all). Take your time – and, as always, I’d love your feedback! Let me start by saying I might not be going back to school if it weren’t for social media. My online networks have provided such transparency of knowledge, such generosity on the part of the amazing people in my network, that I have been inspired to explore new worlds. I’ll share two different aspects of my background with social media. I recall starting an email “conversation” with a colleague several years ago, when I had an epiphany about understanding the value of forum posts in online communities. The conversation that the two of us were starting in the back and forth of email was on a subject that I knew was of interest to others in an online community we had started. My next email to her was a request that we take the subject to our group forum, and conduct our back and forth there, where other people could join in. It may sound obvious, or silly, but that was an exciting moment for me. I have benefited so much from the ideas and solutions that others have shared online, whether they’re people I know In Real Life or strangers who I have found only through a Google search looking for an answer to a question. I am always trying to find ways to contribute my knowledge back to a variety of open communities. Yes, this is part of why I’m going back to school – I’m hard on myself, thinking “What knowledge do I have to share online that would really make a difference to someone?” I probably have more to offer than I give myself credit for, but still I want to keep learning and growing – and contributing back. I laugh when I think of my first reaction to Twitter. I received an email from a colleague, probably early in 2009, inviting me to join Twitter, and I clicked through to check it out. But I didn’t join then – when I saw the prompt: “What are you doing?” my first response was “Who cares?” and my second response was “Who’s business is it?” I just didn’t see the value. Then, several months later, I went to THATCamp at CHNM (if you don’t know about THATCamp, check out my blog post about THATCamp Museums on my other blog). It seemed like everyone there was using Twitter – everyone but me, that is. I was having a blast, meeting amazing people, having amazing conversations, but having a hard time choosing between simultaneous sessions to attend. Lo and behold, people were using Twitter to be in two (or more) places at one time – attending one session, but following the tweets from another. People were using Twitter to continue conversations after a session had ended, or to make plans to meet up in person later to continue the conversation. Let me edit that – people who had never met before were using Twitter in those ways. It was just an extension of the conversation, that defied boundaries of time and place (it’s possible to participate virtually in events hundreds of miles away, by following tweets and adding my own to the conversation). Does it go without saying that I joined Twitter that weekend? Or that through Twitter I’ve stayed in touch with people I met that weekend? Through those people I have “met” others on Twitter who have shared resources and offered advice, even have offered support – like congratulating me when I announced I was starting my MLIS! Two different librarians I met that weekend, and kept in touch with via Twitter, offered extensive personal advice about my decision to go back to school. This sense of open community, of transparent knowledge, is exactly what makes social media so transformative in the world of libraries. One person’s quest for knowledge is no longer so solitary an act, played out in a private study carrel hidden in the stacks of a quiet library. The person in that private quiet study space may be sharing what she’s learning online, for the whole world to see – for me to learn from, and contribute to, and build upon. The generosity in this sharing is what libraries are all about. I’ve had a lot going on lately, feeling like I’m pulled in a lot of different directions: going to library school, building a prototype for a new inter-institutional digital library of historic dress, maintaining a collection of historic costume, costuming academic theatre, keeping up with my family. But the fact is, they’re not really different directions. There’s one aspect that unites them all on one path, and it’s: ME! Well, I should say, me and my personal mission. I’m working on reminding myself, at least on a daily basis, about why I’m doing all that I’m doing, and how everything is related to my mission in life. So, I had started a separate blog to track my reflections related to library school (some of which are required for coursework), but after just two posts I was feeling fractured. I had intended to neatly compartmentalize that part of my life, but the fact is that it’s not a neat compartment at all. It’s all tied together with the rest of my life in some very messy, and very fun, and very exciting ways! So, from now on, you’ll be seeing some posts here about various aspects of librarianship. This still doesn’t mean I’ll keep all my blogging in one place – this fall I’ll be adding some updates on the blog for the Vassar College Costume Collection, and I’ll be contributing to a new blog about the digital library we’re building at HistoricDress.org. But I’ll try to post some links to all of that here, so that this is where I’ll be grounded, on the path where it all comes together. Thanks for joining me, however briefly, on this path! What a great way to start my summer! 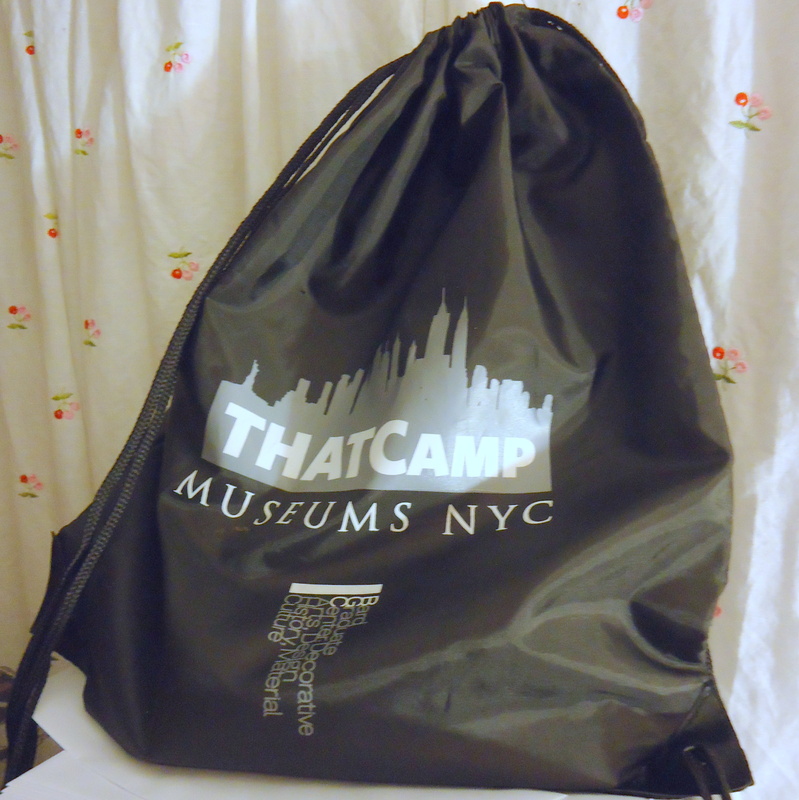 On May 18-20 I had the privilege of attending THATCamp Museums NYC at the Bard Graduate Center. I’m a huge fan of THATCamps, and this was my third and personal favorite, for reasons I’ll get to in a moment. THATCamp, which stands for The Humanities and Technology Camp, is an unconference event bringing together like-minded people to meet up and hash out whatever issues are important to attendees at that time, including both conversations (yack) and hands-on workshops (hack). THATCamp originated at the Roy Rosenzweig Center for History and New Media (CHNM) at George Mason University in 2008. I attended the 2nd THATCamp at CHNM in 2009, and it was a pivotal event for me. The casual, non-hierarchical, spontaneous nature fosters important conversations across disciplines and between institutions. I was amazed at how quickly I was jumping into serious conversations, about issues really important to me, with people I had met only moments before (especially in the session I proposed on “Digital Collections of Material Culture“). Fast forward more than two years, during which time THATCamps went viral, branching out into a multitude of regional and thematic events. My 2nd THATCamp was actually on my home turf: THATCamp Pedagogy at Vassar College in Poughkeepsie, NY. Again, it was a blast, and it was fascinating to see how technology is helping us to take a closer look at pedagogy. The session I proposed took on the title “Teaching with Absent Objects,” merged with a session on “Teaching in the Community,” and continued the thread of teaching with digital surrogates of material culture. So, now perhaps it’s obvious why THATCamp Museums NYC was my favorite so far: yes, digital material culture is my thing, and where my previous THATCamps had a few enthusiastic sessions on this topic, in this case essentially the entire weekend related to that focus. So, what did the weekend entail? Well, let me interject the fact that my only real criticism of the THATCamp format is that there are usually 3-5 sessions offered at the same time, and I usually want to go to ALL of them! So take a look at the blog for the full schedule of sessions and workshops. I personally agree with the call for “more hack, less yack” at THATCamps, and while all of the workshops on Friday were in this vein, I tried to choose the ones that really pushed at my hacking boundaries. I ended the day with Kyle Jaebker from the Indianapolis Museum of Art showing us about this “open-source toolkit for the creation of mobile tours currently consisting of authoring tools, an iOS application, and a web-based application.” I was struck by the idea that TAP could play really nicely with Omeka, and indeed there’s been talk just this week in the Omeka Developers Group about a plugin. I love that TourML is pronounced “turmoil,” since that’s absolutely what the planning team for an exhibit/tour goes through! Since I’ve seen Beth Harris and Steve Zucker present before, I made the difficult decision not to attend their workshop about Smarthistory, the online art history resource that is one of my favorite examples of a technology/pedagogy win-win. I’m looking forward to watching the video of their workshop when it’s available, and catching up with their latest news since they’ve become a part of Khan Academy. I also will definitely be on the lookout for the video of Jefferson Bailey’s workshop on Viewshare – this is another tool that I’m looking forward to playing with this summer. I have a couple of different data sets ready to plug in and see what comes up in the maps, timelines, and faceted browsing that has to offer. On Saturday, after breakfast, an overview of the “rules,” and scheduling negotiated very well by the whole group, we were off to a great start! my digital costume project at Vassar – my own two minutes to show off my work in progress were unfortunately more dorky than short (the high res images loaded too slowly to be able to show off much) but I’m really eager for feedback so that was the risk I took – please check it out and let me know what you think! I was sad to miss the sessions on Curatorial Collusion and Ephemeral Performing Arts, among many others. Thanks to Kimon Keramidas and everyone at the BGC, and Amanda French and everyone at CHNM, for organizing such a great event! The BGC was the perfect venue to kick off what we hope is just the beginning of THATCamp Museums. So, what’s the moral of the story? If you have the chance to go to a THATCamp, do it! And propose a session, and participate in the conversation, even if you don’t know anyone there and your session proposal is just a question about something you want to learn more about. No matter what, you will have something to contribute (which will be empowering), and you will learn something. Then, take what you’ve learned, what you’ve discussed, and make something! Everything I absorbed is feeding back into my digital project at Vassar, and a new project I’m starting with a group at Smith College, soon to be at HistoricDress.org. I’ll be busy this summer putting some of these ideas into action. Big news! You may already have an inkling of this from some of my tweets, or you may be one of the wonderful people who generously offered me advice about this decision . . . This month I am beginning the MLIS program at Syracuse University – also on the track for a CAS in Digital Libraries. This is a huge step for me, and yet not as huge a change as you might think. I have weighed this decision so very carefully, and it feels so momentous, and yet in most ways life will go on as normal. I will continue to work part-time at Vassar, in the costume shop and with the historic clothing collection. I will continue to live at home in Saugerties with my husband and daughter. All that is possible because I’ll be pursuing the degree as a distance student, taking asynchronous classes part-time around the rest of my life. But now, instead of spending all my non-work, non-family time working on digital projects as a “hobby,” I’ll be working on digital projects as coursework toward the MLIS degree. For those of you who know me as a costumer, this may seem like a big career switch. Of course it is, but it doesn’t really feel that way to me. My interest in digital libraries (digital cultural heritage, really) has grown very organically from my work with costumes. For ten years I’ve been working to create digital access to Vassar’s collection of historic clothing. This has been a slow moving project: with limited funding or institutional support, it’s been me and a few students building it in our “free time” outside of other commitments. You can see it at http://vcomeka.com/vccc/ – but remember, it’s still a work in progress! With all the work I’ve put into this and all I’ve learned along the way, I’ve realized that it is not just in the context of historic clothing that this work interests me. There are some broader themes in my work that I’m ready to explore in a more formal way. My mission is to give artifacts the respect they deserve in their representations online, helping them to tell their own story rather than just serving as illustrations. As everyone talks about the intersection of libraries, archives, and museums, I want to make sure that education is a priority at that intersection, and that material culture is a valued resource for a diverse community. I’ve had a wonderful, albeit informal, education in this area over the last ten years, and I’m very grateful to everyone who’s helped me on this journey. Many who have helped are librarians, and it is my great respect for them that has inspired me to want to join their ranks. My informal education continues, but now a more formal part also begins . . . I want to critique the critiques, or lack thereof. Don’t get me wrong, I love McQueen’s designs and I enjoyed the show, if that’s the right term, immensely- I enjoyed it precisely because of how disturbing it was, and in the weeks since, I’ve thought a lot about what the work in the show questions about fashion, survival, sanity, sexuality, power, and roles of women. And in the weeks since, I’ve been looking for other reviews, imagining that someone else has already articulated some of my thoughts. Well, kind of. Where there are mentions of misogyny, they are quickly dismissed. The brief conversation seems to go: yes, there are some perverse issues here, but the clothes are brilliant. Period. So, let’s reverse that. The clothes are brilliant, but there are some perverse issues here. Let’s discuss. I feel like there’s an extent to which this is a case of the emperor’s new clothes – after waiting in line for two hours to see the show, are people reluctant to view it critically? “Genius!” I hear. “Brilliant!” Well, yes. The clothes are masterpieces. I could have stayed for hours more, studying every minute detail, were it not for the crowds. The exhibition design is also masterful in it’s immersive theatricality. But is it possible that maybe, just maybe, McQueen would have wanted this show to provoke a conversation? After you saw the McQueen show, did you have the opportunity to discuss it with anyone? In my case, my friend and I were physically exhausted after our time at the Met, and I know I needed some time to process what I had seen, so we went our separate ways and headed home. In the weeks between then and now, when the subject has come up, I’ve tried to get people talking, sometimes more successfully than others. So, please, I know it’s closed now, but please sit down for coffee with the friends you went to see the show with, or find someone else who went on their own, or just take a look at the images and videos at http://blog.metmuseum.org/alexandermcqueen/. Now, talk amongst yourselves. In my household, raising my nine year old daughter, the phrase “actions speak louder than words” comes up a lot. In the text throughout the exhibition, curator Andrew Bolton uses Romanticism as the lens through which to look at McQueen’s work. Quotes from McQueen himself are also spread throughout, with quotes in the first rooms expressing his desire for women who wear his clothes to be empowered, feared by others, armored against the world. Sounds good, right? But as you progress through the rooms, it is not strong powerful women you encounter, it is women (mannequins) whose eyes and mouths are covered, who can’t see or breathe. It is women (in videos from McQueen presentations) in shackles, or attacked by robots, or being urinated upon, or pawns in a game, or drowning. If you’re not sure where to begin your conversation, consider these questions. Is there a designer who successfully sends models down the runway who are empowered, armored, fear-inspiring, as McQueen verbally expressed hope for his? If so, how do they pull it off? If not, why not? Is the runway as a setting not appropriate for that character? Are there other settings that McQueen-clad women can more successfully play such a role? Do the clothes, without the styling, offer alternative messages? Another phrase we rely on in my household is “knowing when to stop keeps you out of trouble.” Unfortunately, Alexander McQueen took that one a little too far. R.I.P. P.S. Another question to consider – what’s up with the tiny hologram of Kate Moss? Why was it at the eye level of a child? Oh, and if someone else has addressed this more fully, and I somehow missed it, please send links my way! Please turn that off, it’s distracting. Last night I was very pleased to attend the kick-off event for Vassar College’s year long celebration of its 150th anniversary. The evening began with a reception for the opening of an exhibition at the library, “The Most Perfect Education of Body, Mind and Heart: Vassar and the Liberal Arts,” curated by archivist Laura Finkel and history professor Rebecca Edwards. This exhibition showcases a wonderful selection of items from the Vassar archives that help to tell Vassar’s story, from its founding to today, with a wider context for some of the key issues of women’s education. I look forward to reading the accompanying catalog. This reception was followed by “Vassar and the Liberal Arts: Then and Now,” a lecture by Rachel Kitzinger, Dean of Planning and Academic Affairs and professor of classics. Rachel is an inspiring educator, and her advocacy for the processes of teaching and learning at Vassar has been extremely influential for the college, and for my own work. Ever since this event was announced, I had been looking forward to hearing what Rachel would have to say on this subject, and when her talk began, I immediately set to taking notes on my iPod touch. Rachel began with the derivation of the word “liberal” and the significance of the liberal arts education as an education suitable to a free person. This moved me from the start. How we take our freedom for granted! And yet, how current socio-economics limit education. She discussed the manner in which it is not what, but how we learn. As a member of the Drama faculty, I was particularly touched by her discussion of Greek theatre as the first form of mass education. Her discussion of the art of asking questions took me back to my own days as a Vassar student, and reminded me of my constant concerns with my own teaching and with my concerns that theatre-making, like teaching, needs to provoke questions rather than answers. But, not long after those notes were taken, the evening took a turn for me. A gentleman sitting behind me tapped on my shoulder and asked me to turn off my device, that it was very distracting to him. I apologized and immediately turned it off. Then, the next several minutes of Rachel’s wonderful talk were lost to me, as my attention had turned to my embarrassment – mainly for a concern that this gentleman didn’t realize I was taking notes, but thought that I was texting or doing something otherwise unrelated to the lecture. I would not dream of being disrespectful to Rachel – in fact, I was immersed in her words until his interruption. Of course I did not want to be a distraction to him, which is why I did immediately turn off my advice, regretting that I had interfered in some way with his enjoyment of Rachel’s talk. The hall was darkened for her slides, and my screen was indeed distractingly bright – it didn’t occur to me until it was too late that perhaps I could just turn down the brightness on the screen. A few minutes passed and I collected myself, discreetly reaching into my purse to find pen and paper to continue my notes in a more traditional way, scrawled in the dark. I was, I am, embarrassed. But should I be? As these thoughts have festered overnight, I have been thinking of our students’ use of technology in the classroom, in similar lecture halls. With my production-based work in the costume shop of the drama department, this is not an issue for me. The technology we use is needle and thread, perhaps a sewing machine, and the computer provides music in the background. But if I was teaching in a more traditional classroom, would I feel that students using technology were a distraction, disrespectful to me and to their fellow students? The short answer is no. For several years now I have been working to digitize Vassar’s collection of historic costume, housed in the Drama department. That work has taken me on a path of discovery, entering the world of digital humanities. I have been concerned with the need for digitization to better represent the complex nature of three-dimensional artifacts, beyond the brief two-dimensional representations that are so common in digital collections today. All of this came out of my own memories of being a student, and the technology that was not available to me at that time. What if the slides that were shown in class could be consulted after the class was over, in a dorm room, at 2am? How wonderful to have that precious time in the classroom reinforced after the fact with digital access to classroom resources! How wonderful to listen to a recording of the class lecture, and rewind the part that you didn’t quite understand the first time, or look at that image of a painting more closely and really see more of the detail! As I have worked with a variety of students with different learning styles, and as I have become aware of the differences between my own learning styles and those of my students, I have come to embrace the potential of technology to provide alternative forms of access to the same content. In short, I have come to see much of technology in the classroom as assistive technology. I have never been labeled with a particular disability, and I rarely have students who share that they are. However, over my years of teaching I have become very aware of the fact that we all learn in different ways, that our brains are very individualized in terms of how we process information, that students need to learn to advocate for the methods of learning that work best for them, and that teachers need to be open to multiple alternative methods coexisting in and out of the classroom. Though I am now teacher more often than student, I am constantly seeking out opportunities for professional development, and for years I have been fine-tuning a system that is best for me to keep notes, both from lectures and from reading. I have gone back and forth between hand-written notes and device-assisted notes (laptop, iPod touch, iPad). Sometimes handwriting works better for me – after all my years of thinking I was a visual learner (and indeed I do have a somewhat photographic memory) I have discovered that I am more of a kinetic learner – the act of writing imprints the words on my brain as much as viewing the writing does. I have found it indispensable to have my notes in machine-readable form, so I can easily search through them, and cut and paste from them for longer passages of writing. Perhaps I cannot say that my iPod touch is assistive technology, when my only disabilities are extremely poor handwriting and the negative effect of stress on my memory. It is a function of my age and career that I need something to help with my memory – between two different part-time jobs (both at Vassar, but very different) and being a mother and wife, I am constantly multi-tasking, constantly switching gears. I have read studies suggesting that my memory will actually improve with age, as I mature out of such an over-stressed period, and I can only hope that they speak the truth. But for now, I need all the help I can get, and my iPod touch is a huge help. Perhaps I should have seen this event as the kind of lecture that is more of a sermon, more of a piece of theatre itself, either of which would render note-taking of any form inappropriate. But I experienced the moment as an active student rather than a passive audience member, and it was important to me to remember some of her words after the fact. A key theme of Rachel’s talk was how a Vassar education helps with the important developmental step of acknowledging the validity of opposing views, yet being able to choose a particular point of view and move forward into action. So, here’s an example: I acknowledge my neighbor’s distraction, but my point of view is that I have the right to use my device to help with my learning. Yet, even after saying all of this, I still feel embarrassed. So, to avoid that feeling in the future, how should I conduct my note-taking in the future? If I do continue to use some sort of device, how can I make it less distracting to those around me? Should I care? Even if you tell me I shouldn’t care, I still will.